Experts say an aging population and health reform will make the health care industry a hotspot for jobs. NEW YORK (CNNMoney) -- As the pace of hiring slows and job opportunities dry up, one industry will remain the rare bright spot in an otherwise dismal job market: health care. The health care field is one of the few industries that sustained steady growth, even through the recession, adding jobs every month for the last eight years. And that growth should continue. Two factors -- an aging population and health reform -- guarantee that health care jobs will be there for the taking, experts said. "Health care jobs are driven by demand. 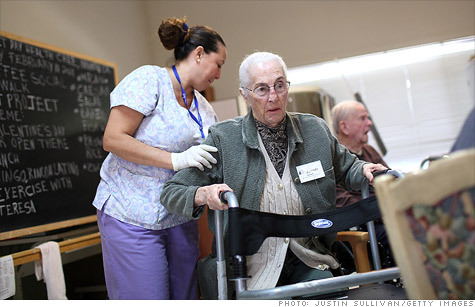 An aging population simply needs more medical care," said Sophia Koropeckyj, managing director with Moody's Economy.com. "The leading edge of baby boomers are now 65. They are needing more health care," she said. "But the biggest bulk of baby boomers are still 10 years behind." That means the industry will need to ramp up fairly quickly to meet a surge in demand for health care service in the coming years, she said. Others see health care reform as another catalyst for more jobs in the field. "The big provisions of health reform, such as the health exchanges, won't kick in until 2014. When they do, it will bring give millions more access to health care," said Nigel Gault, chief U.S. economist with IHS Global Insight. Gault anticipates this will result in more demand for health care services and more jobs. "There's some concern in the industry about whether there's enough qualified health care professionals to meet this demand," he said. Still, this uncertainly bodes well for health care hiring. According to the government's June jobs report, health care hiring rose by 14,000 jobs last month while hiring in most other industries dramatically slowed to a crawl. More bragging rights: In the past 12 months, health care has added an average of 24,000 jobs per month. But that trend goes back even further. Health care jobs have increased every month going back to July 2003, according to the government. Since 2001, health care's workforce has grown 28% to about 17 million in 2011, according to the government. Over the next decade, Koropeckyj expects health care will remain a fertile area for hiring and forecasts a 24% growth in health care jobs, or 4.3 million additional jobs until 2021. Dr. Joseph Kim, founder of nonclinicaljobs.com, tracks shifts in health care jobs. Kim said one recent trend contributing to an uptick in physician jobs are hospitals adding more physicians and specialists to their in-house staff instead of contracting with them. He said hospitals are doing this through new hires as well as acquiring independent practices and groups practices. Kim also expects ancillary health care jobs such as nursing assistants, medical assistants and health IT jobs to be hot growth areas as hospitals and health clinics expand into suburban areas and health providers rush to meet health reform's deadline to update technology and transition patient records to Electronic Health Records. -- Bill and account collectors are forecast to increase 66%. Industry experts peg the growth to an increase in billing as more Americans get access to insurance and health care under reform. -- Cardiovascular technologists and technicians jobs are expected to grow 52%. Kim said as boomers age, they will need more stress tests and cardio scans, which will require experienced technicians to operate the equipment. -- Public relations specialists are forecast to rise 52%. "The interesting phenomenon happening right now is hospitals and health centers embracing social media," said Kim. As a result, he said hospitals are hiring people who are "social media" or public relations "specialists." -- Physician assistants are expected to see a 52% increase. Kim said the current shortage of primary care physicians means many health centers in areas facing doctor shortages are using physician assistants to fill the gaps. -- Pharmacy technicians are forecast to grow 52%. This trend may be fueled by the rapid growth of retail pharmacies and support staff needed to work with pharmacists. -- Customer service representatives are expected to rise 52%. Kim said more hospitals are changing their models and adopting a more customer-centric approach, which includes conducting customer satisfaction surveys. -- Massage therapists are expected to increase 52%. An aging population is boosting demand for this type of service, said Kim, as well as a slow shift away from conventional drug therapy. -- Clinical, counseling, and school psychologists are forecast to rise 43%. Again, Kim points to the aging population and more instances of depression and anxiety as the reasons behind the projection. -- Registered nurses are forecast to also increase 43% as health care centers boost their medical staff in anticipation of rising demand for services.